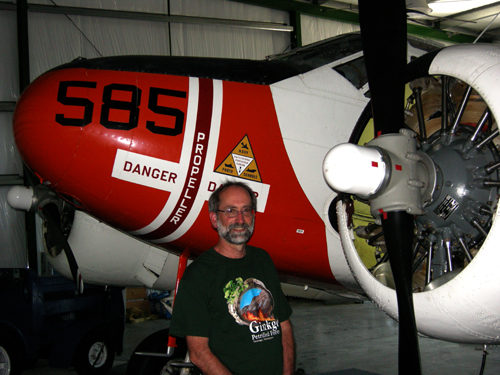 At the end of last month I flew with Michael Kopp in his Beech 18 RC-45J. 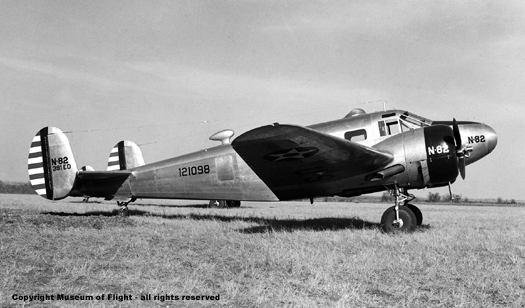 This iteration of the Beech was used for aerial reconnaissance by the Navy and is very similar to the AT-7 though it lacks the astrodome used by navigators. We flew east from Auburn Municipal Airport, into the Cascade Mountains. I know this area pretty well from driving through it or hiking and skiing in it yet I had a hard time identifying any landmarks other than Mt. Rainier to the south. It was a clear, sunny day, with not a trace of turbulence except for when we went over Snoqualmie and Stampede Passes. Had the weather been poor, with rain, wind, turbulence, and limited visibility, it would have been a scary flight. It's hard to imagine making a crossing of the mountains in such poor conditions. Not only would the airplane be bouncing all over the sky, you would have a hard time getting your bearings. Is it any wonder aircraft rely so heavily on instruments and navigational aids today? What a GREAT advancement to aviation. The Beech looks like a large airplane from the exterior, especially when it's confined to a hanger. But once inside I was shocked by how tight and cramped the space was. I'm not a bulky fellow, and neither is Michael. Still, the cockpit was terribly confining. Lt. Bill Gamber and Cadet Glenn Munn were both tall men - well over 6' in height. Gamber played basketball in college. He was slender in build but Glenn Munn was not. I don't know about Mortenson or Mustonen. Because of the confining space, I suspect the three cadets remained in the cabin during flight rather that passing back and forth to sit in the right seat and do their navigation there. If this is true, it blows a hole in the theory that Munn and Mustonen were found together because they were in the cabin together. If this reasoning is true, Mortenson's remains should be close by as well since I doubt he was in the cockpit with Gamber. Also, there is a very slight bulkhead between the cabin and cockpit and the first cadet would have been only three feet away from the pilot's seat. No, I don't believe anymore that the location of Munn and Mustonen had anything to do with where they were sitting in the AT-7 41-21079 when it crashed. The Beech is a strong-flying airplane at lower altitudes. The engines, deep and loud on the ground, assume a slightly higher pitch and are not so rumbling once off the group. Listen to them HERE [397 kb]. Certainly too loud for carrying on a conversation. If you listen carefully towards the end, you can hear Michael and I talking into the mics on our headsets. An amazing quality of the aircraft is the way it climbs. Actually, it doesn't really climb so much as levitate or lift itself through the air as if inside an elevator. It's a totally unusual feeling. In big jets, commuter aircraft, and small private airplanes that I have been in, I've always sensed the airplane climb. Maybe it's an artifact of my mind, creating that climbing sensation. But I certainly did not feel that way in Michael's Beech. It was a glorious experience. Michael took this photo of me in front of his airplane.